Over the past decade, the funding gap for US public pension plans has widened considerably, and many state and local plans today find themselves in desperate straits, facing an aggregate shortfall in excess of $4 trillion. For some municipalities, like the city of Detroit, Michigan, the only viable recourse has been to file for bankruptcy protection. Pensioners, taxpayers, and investors all stand to lose. What is the primary cause of this public pension crisis? We put this question to the global readership of the CFA Institute Financial NewsBrief earlier this week. What is the primary cause of the underfunded status of most public pension plans in the US? A plurality of the 1,020 poll respondents, 45%, thinks the chief culprit is overly generous benefit packages. Indeed, the agency conflict associated with politicians currying favor (and votes) with public employee unions by promising unaffordable pensions is hard to miss. Approximately 25% of respondents put most of the blame on plan managers. Ominously, if not surprisingly, fund managers have responded to the funding crisis by taking on more risk, investing roughly two-thirds of their assets in equities today, up from 23% in 1980. Such an aggressive asset allocation boosted returns in 2013 but ultimately may prove costly. 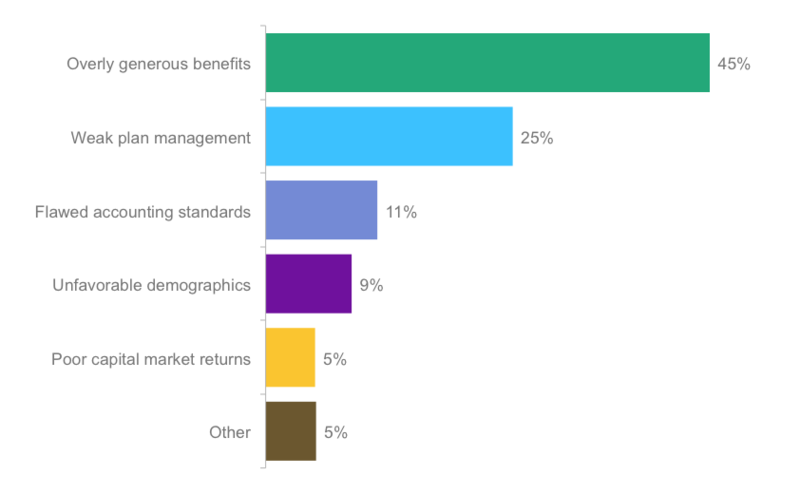 Unfortunately, accounting rules in place today, under GASB, incentivize risk-taking, and these arguably flawed standards were cited by 11% of respondents as the main cause of today’s pension crisis. Plans typically discount their liabilities using an unrealistic expected rate of return on plan assets rather than a rate that is more reflective of the risk associated with future payments. Changing demographics (9%), characterized by a sharply declining ratio of active workers to retirees, and poor capital market returns (5%) were seen as less consequential by respondents. We will explore this topic further on 18 March 2014 in an online forum featuring a panel of experts, including Andrew G. Biggs, resident scholar at the American Enterprise Institute; Jeremy Gold, an independent pension finance consultant; Robert Novy-Marx, associate professor of finance at the Simon School of Business, University of Rochester; Ronald J. Ryan, CFA, CEO and founder of Ryan ALM; and M. Barton Waring, retired global chief investment officer for investment strategy and policy at Barclays Global Investors. The primary overriding factor is the failure of many State Governors and Legislators refusing tomake the annual payments established by sound actuarial standards. Costs must be balanced by the fact that, as a group, many if not the majority of Public Employees were paid lower salaries than those paid in the private sectors during their working lives.